Electric blue with grey is a great combination. Get rid of the hanky in the top pocket though! rarely in the states have i seen a double breast fit so slim. The buttons actually help show off the proportions of his build instead of being boxy like cuts I see in the US. If all your suits are cut so well its quite the incentive to stay in shape. fantastic-the scarf brings out the blue in the suit. An ‘electric blue’ scarf, right?… What is that song ‘electric blue baby I looove youuu?’ oh gosh 80′s flashback :( shoot me now! Love everything about him, except the colors, they take me back to the 80′s… or is it the combination?… maybe the hair, Miami Vice comes to mind. Oh! I’ll stop now. Ah, this guy looks classy. Love that pink handkerchief. Love the look overall, however the scarf seems a bit overwhelming. A shorter one may have worked better. Great use of color, and the pocket square is absolutely perfection. I usually scoff at tight waisted jackets, since most of them look to me like bad sausage casing, but in this case, bravo. And bravo for the scarf (ah, that’s not royal blue). I love the whole drape aspect of the photo, including the drape of the fellow’s hair. The pocket kerchief annoys me, but most of them do. You have to have a lot of confidence to wear this. I think he looks great. 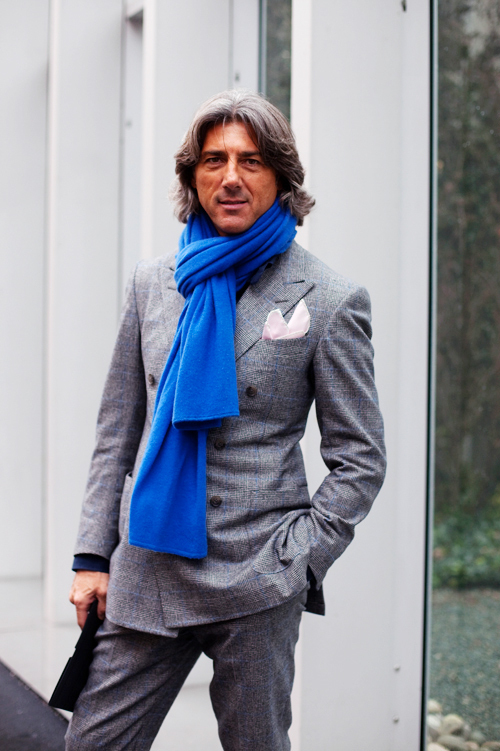 it’s really incredible how the bright blue scarf really emphasizes the stripes of the suit. these are the kind of subtleties that i really appreciate of italian style. while i think italian aesthetics are generally written off amongst popular culture as sort of gaudy and over the top, this is really a quiet elegance. Uh, O.K. Looks like he’s living it up. The cut IS amazing. Every guy should go for it while they can! Ah!!! Milano….Italians have the key. He looks really great!! Great suit! Love the color of the scarf. It’s nice to see someone wearing such a well fitted suit. I find the unflapped patch pockets to be very unusual, on a bouble-breasted suit nonetheless. They are normally reserved for very casual sport coats. The hair style screams “confidance.” The ensemble is not overly imaginative, but the fit is fantastic and the overall look is stunning. The pocket kerchief should have been paisley or foulard, otherwise perection. 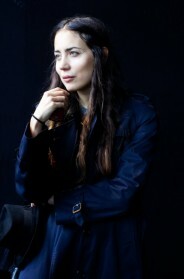 ooohh theres nothing like a great sartorial image to make me feel warm and fuzzy the day after valentines day. I have to comment because although I would never wear that scarf with the suit he is wearing–he makes it work incredibly well. I love the look. i like the sublte matching details. I adore the cobalt blue. Very cool. Very Huxley-esque. Nice to see a well fitted double breasted suit as well. 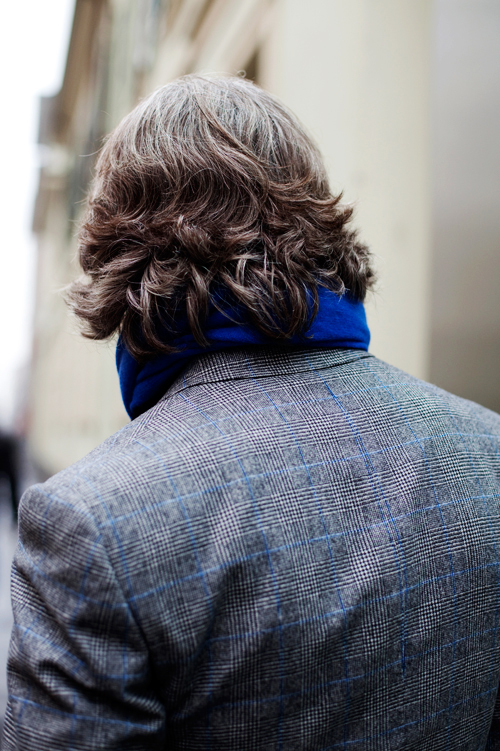 His scarf lends a relaxed look to a very structured suit. I think the bright blue looks great against the gray Prince of Wales and makes the blue stripe pop in the suit…you have to have one thing on your outfit that POPS! and a smile to exude confidence. Sure winner. Great fit! Great fitting suit, scarf is a great color on him. His hair is perfect. Well done look. He looks smart and successful. I absolutely love this wardrobe. What a brilliant saturated blue which compliments and strongly brings out the subtle blue lines of the suit. Love the light pink pocket square that seems to match the light tones of the suit. It’s nice to see him use that color instead of one of blue. Interestingly, from far the blue check in the suit is very subtle. When taken closer the blue really makes an impact, but yet is never busy. Your eye goes directly to the face on the italian man, it is never attracted to the suit unless you think about it… this is how true gentlement put it together. I like the combination of the blue scarf and the grey suite with the small stripes of blue in it:) and a very handsome man! is his name matthew by any chance? This is not the way for a man to wear a scarf. Still less one so out of scale. this guy looks like dustin hoffman!